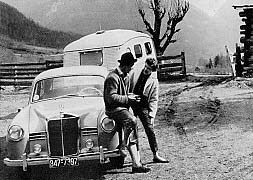 Austria: Camping enthusiasts are starting for the 1957 International Camping Meeting to be held in Stuttgart-Bad Cannstatt. 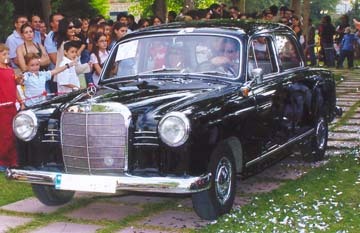 Sergio used parts supplied by Ray Ilich during the restoration. 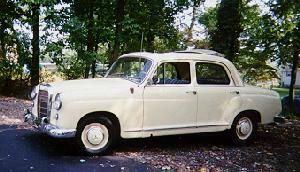 Steve writes, "I have owned the Type 190 Ponton sedan a little under a year now, and just started its restoration — so she is not running at the moment (got bits of her all over my cellar). 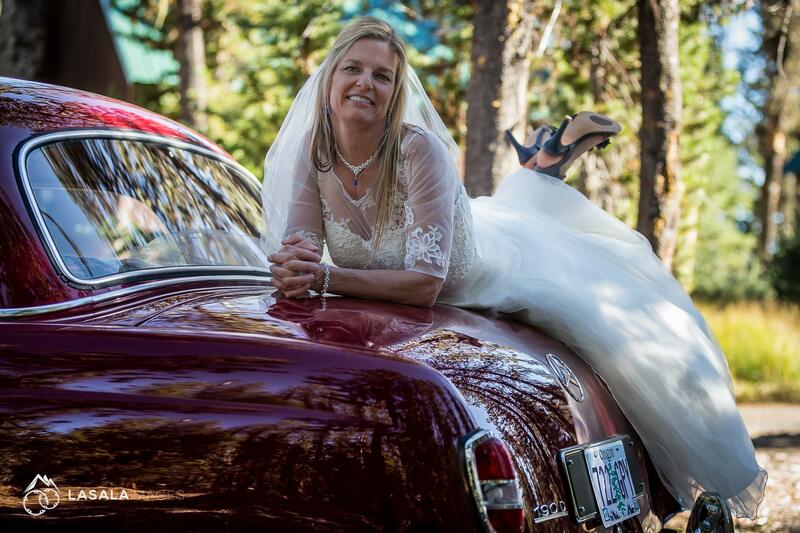 I noticed that she was already listed on your site with her original registration of MVG2 and a cream paint job." "The car is now painted in its original grey and has a new registration number of RSJ198. 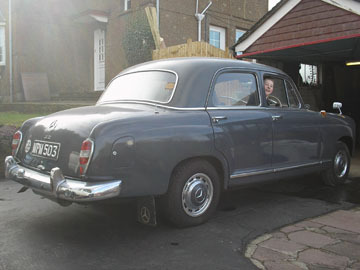 Also note the damage to the bumper and the non-standard wing mirrors." Note the Philips sign on top of the building. 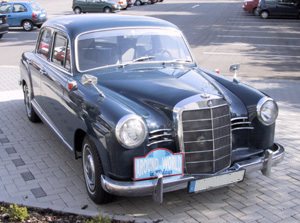 Photo from "Mercedes-Benz In Aller Welt"
A brief history of the car: I have been following your site for over two years while looking for the "right" Ponton. About a year ago I found one in California that looked appealing. 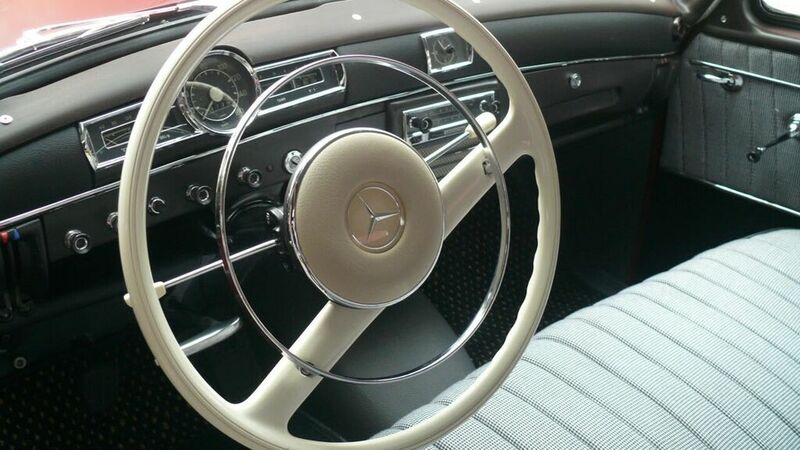 It had 85,000 original miles on the clock and it had been restored. 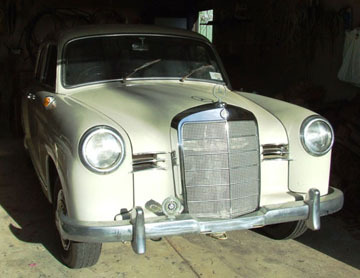 I really do not know much about the car except that it was found, and the restoration began. 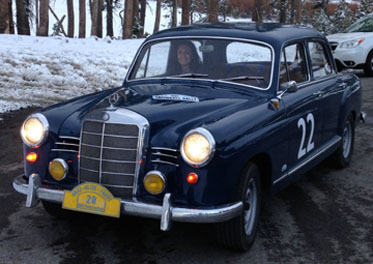 Money ran short, so a Mercedes-Benz buff bought the car and finished the restoration. 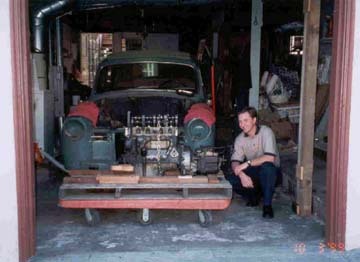 I purchased the car from him as he downsized his collection. I really love it and appreciate your great work to keep the Ponton spirit alive and well. If you have any kind of newsletter or know of one that is focused on Pontons I would like to be included. 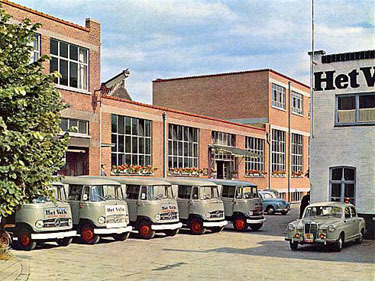 A Type W121 190 sedan and several Type 319 Mercedes work vans at the "Het Volk" printing facility in Belgium. 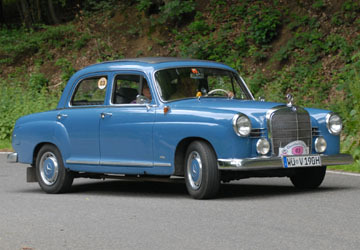 In this photo the 190D still has its French number plates, but I have since registered it here in Belgium. 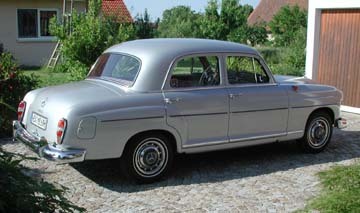 In Europe, it is very rare to find a four cylinder Ponton sedan with a full leather interior. I collected it in the south of France after buying it on eBay. It runs and drives well. 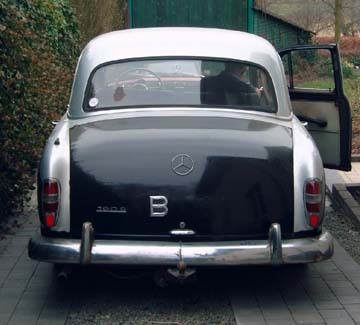 It brings back many memories, as I used these cars for many years as daily drivers because diesel fuel was very cheap then, especially in Holland. 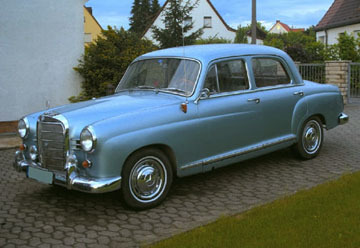 Color: DB380 "Delphine (Dolphin) Blue" (59-61). 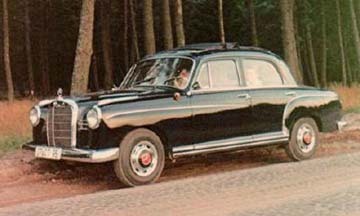 This is an interesting four cylinder Ponton sedan for the extra fender trim, as well as the universal 13" accent trim rings on the wheels. 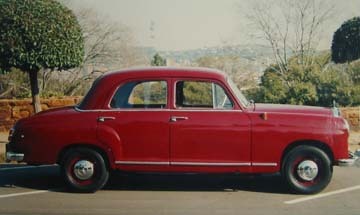 On the four cylinder Ponton sedans, the fender trim was only available by the owner's special request at the local agent, after the vehicle left the factory. 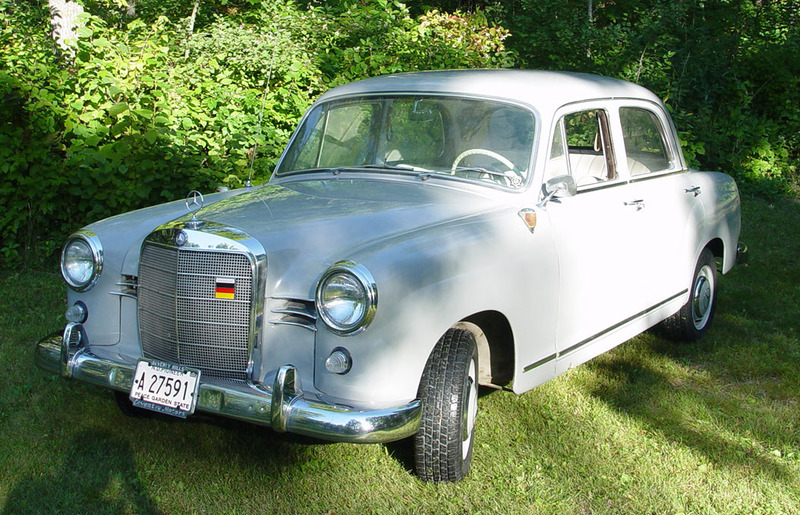 In the USA, that meant the local Studebaker-Packard dealership would affix the trim. 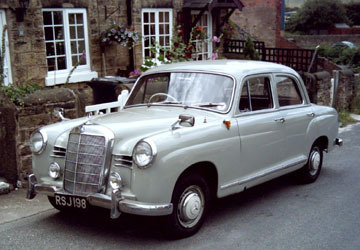 The more expensive six cylinder Ponton models such as the Type 220S and 220SE included this trim as standard. 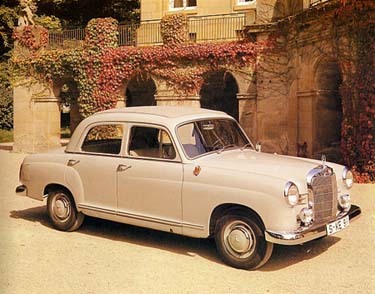 The Daimler-Benz factory in Stuttgart did not offer it as an extra cost option on the four cylinder Ponton models. My wife decided to hire a photographer to take some family photos. 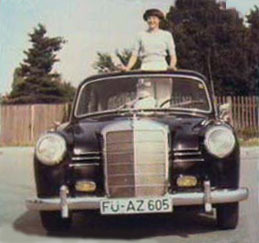 The photographer found out that I had the old Mercedes-Benz, and insisted on taking photos with the car. 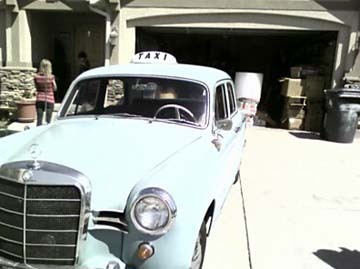 Here is my 1959 Type 190 Ponton sedan (accompanied by his W203 grandson). Currently, it leads a life of leisure in the San Juan Islands (north of Seattle, Washington) where the maximum speed limit is 40 mph, and it is only driven on sunny days. Thanks for the great website! Biodiesel conversion. 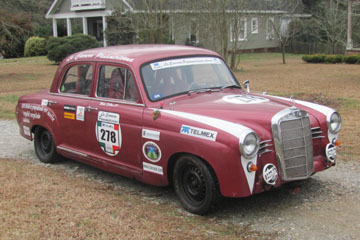 Competed in the 2008 La Carrera Panamericana. She sure is fun to drive, and gets tons of thumbs-up on the road. 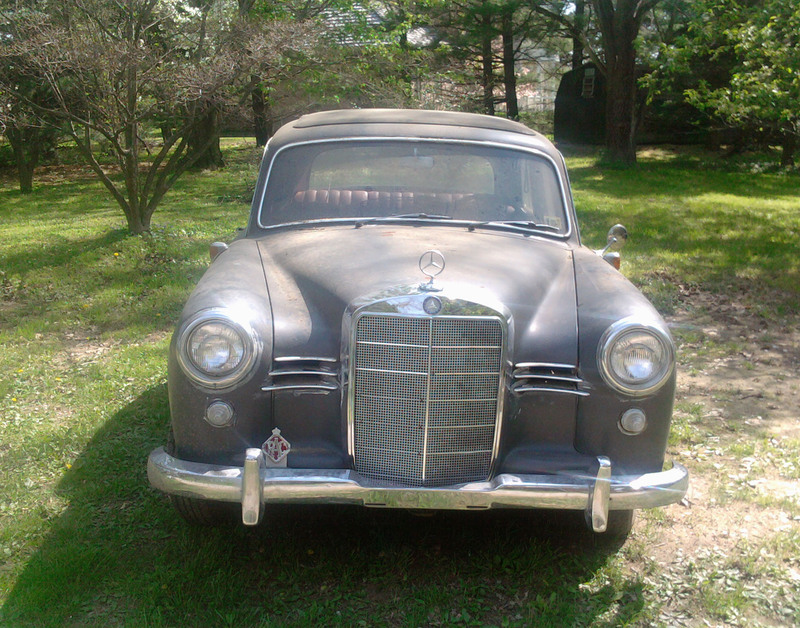 I'll be restoring it to some level, but conserve the as-raced exterior patina. 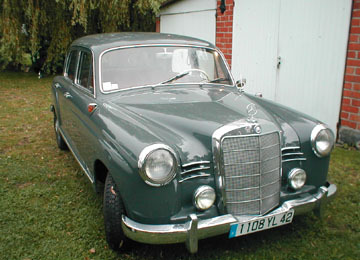 It is my daily driver – 28 mile round trip to work four days a week. 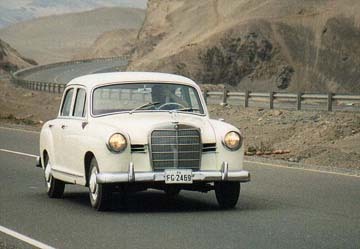 Note the fog lamps. 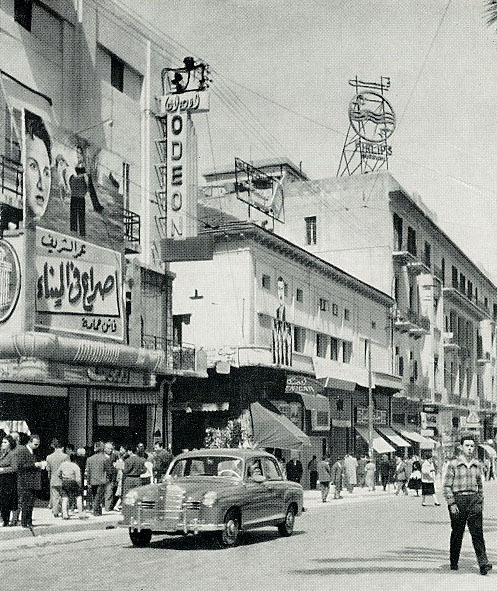 This photo was taken in the summer of 1959. 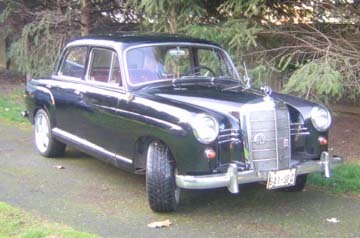 Here is a photo of my 1959 Type 190b that has been in the family since 1962. It passed from my grandfather, to my father, and then to me. That is my son in the photo (in 1993). 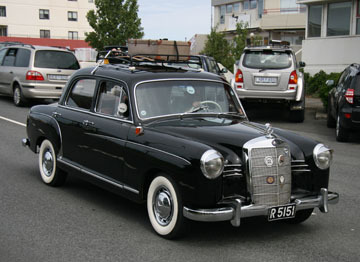 It has also been officially recognized by Mercedes-Benz. 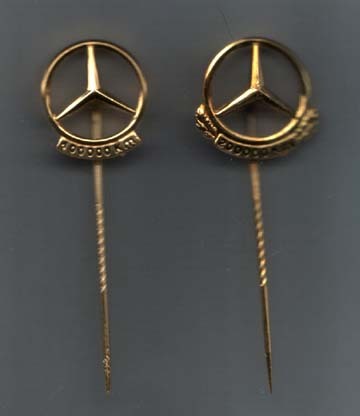 In addition to the high mileage grille badges, take a look at the gold lapel pins and both the 100,000 km diploma and 200,000 km diploma which were awarded by the factory for high mileage. 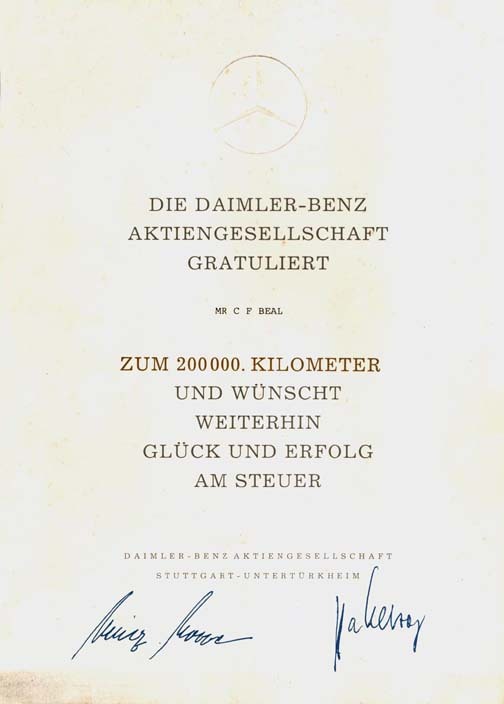 The 100,000 km awards were received in 1981 and the 200,000 km awards were received in 1987. Photos submitted April 28, 2004. 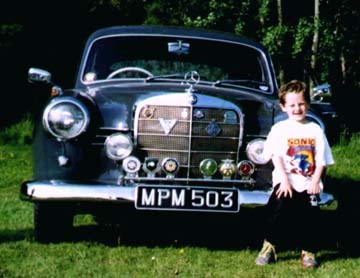 The photo of the 1959 Type 190b with my son dates from 1993. Update / December 3, 2008: Here is a new photo with my youngest son sitting in the car. His brother was in the first photo. 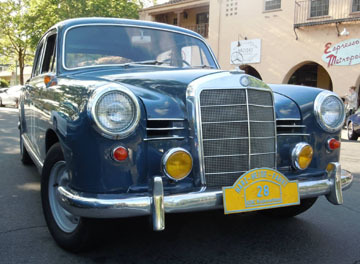 Purchased in 1991 in San Diego, California. 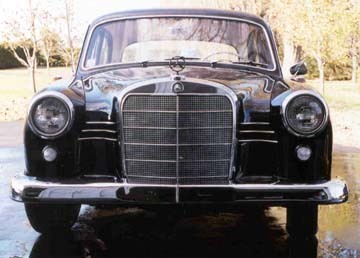 Shipped to Bavaria, Germany in 1995. 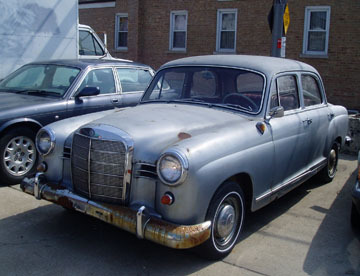 Two owners, no rust at all. 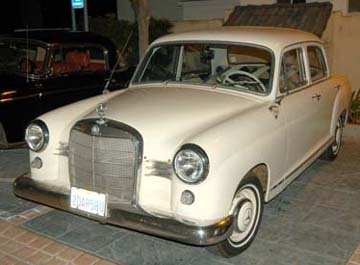 A very nice Ponton sedan with the Webasto sliding sunroof, four cylinder gasoline engine, and four speed manual transmission. 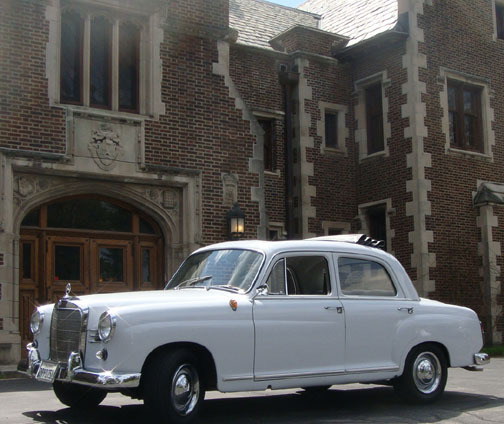 In the first photo, the car is shown in front of the Francis Stuyvesant Peabody Estate which was built in 1920 as the summer home for the Peabody family that lived on Lakeshore Drive in Chicago. The house now belongs to the DuPage Parks District and is available for rent for special events. 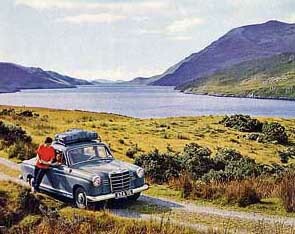 Same car, different location. 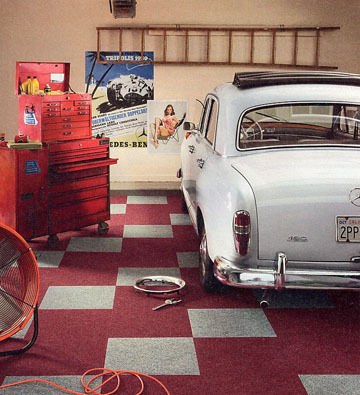 This shot of the 1960 Type 190b appeared in the Fall 2009 edition of the Flor catalog. 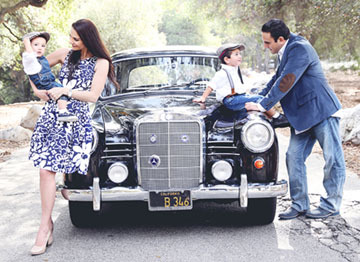 They used Steve's car for one of their promotional shots. 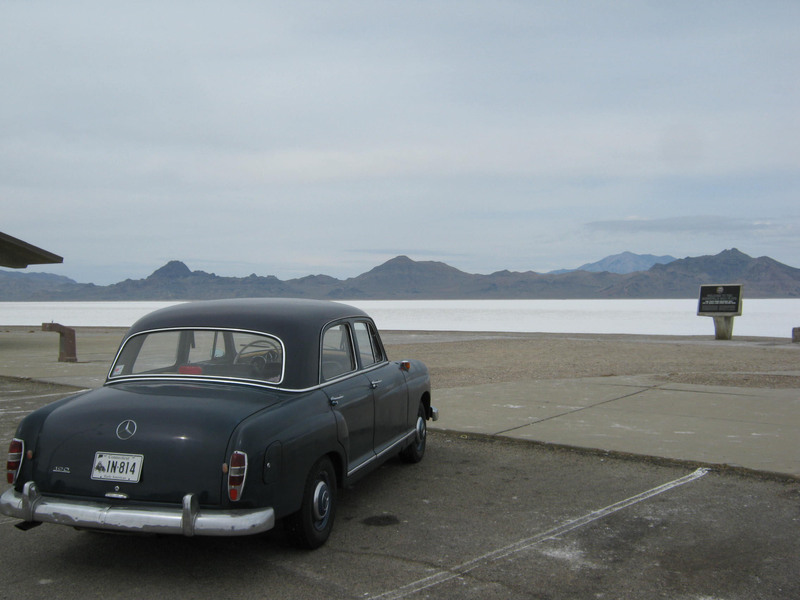 Bonneville Salt Flats in early October 2013 during a cross-country trip from Connecticut to California and back. Total miles on trip: 7,386. 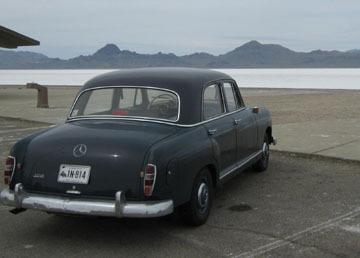 I left Logan, Utah around 9:00 a.m. that day, drove through Salt Lake City, and stopped at the Bonneville Salt Flats Proving Ground on my way to Elko, Nevada (where I tightened my fan belt and generator). 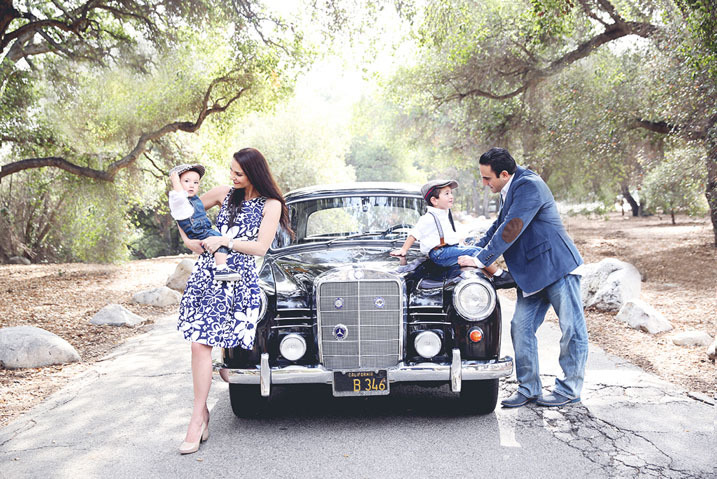 Just thought it might be a nice change from the "shiny car in front of the beautiful house" photos folks often have. I don't have either one! My 190b "resurrection" project is finally drawing to a conclusion. 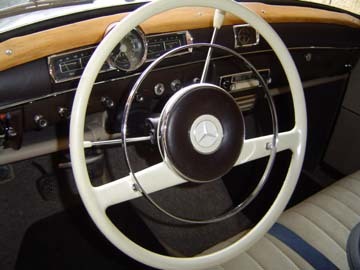 The car was undergoing a complete restoration 26 years ago. 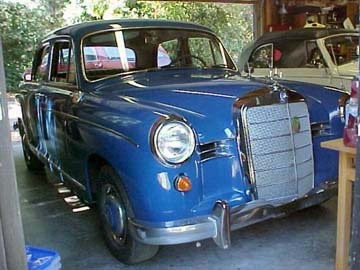 The owner became ill, and sold the project to another guy, who just left it in his barn for 25 years. I bought the project in 2013. It now runs smoothly. 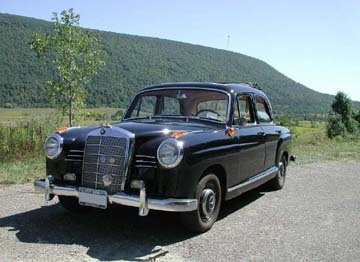 Many thanks to you and the mbzponton.org website for providing the information that saved me a lot of time. 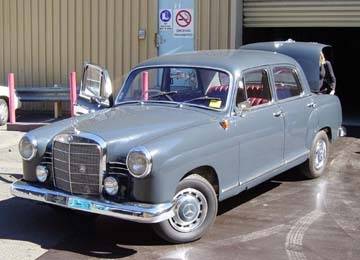 I bought Skippy, my 1960 Type 190b Ponton sedan, on eBay a few months ago from Melbourne, in Victoria. He is my second Ponton. 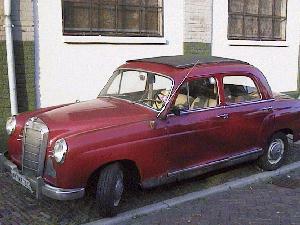 I also have a 1956 Type 220S, which I need to finish restoring. I gave him a paint job, a serious tune up and a lot of rewiring. He rides smoothly and is a pleasure to drive. I hope to have Skippy registered (licensed) by the end of November 2005. 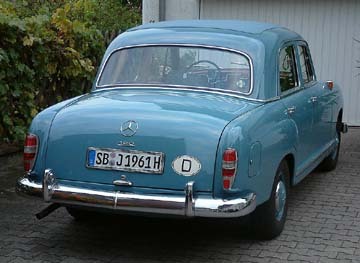 Steffen writes, "This 190Db was built in 1960 and was used by my father until 1977. The next owner sold it in the late 1990s." 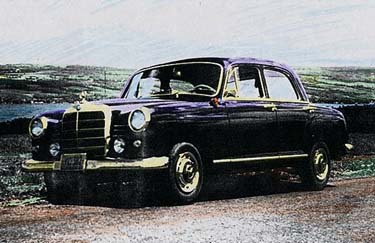 Note the extra chrome trim, and the fender running lights. 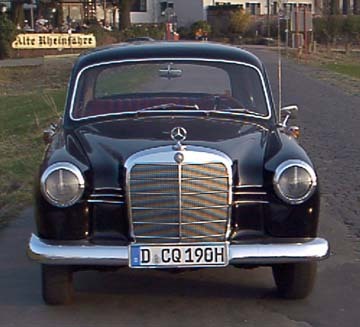 Well, I managed to hold onto the 1960 190D yet again. 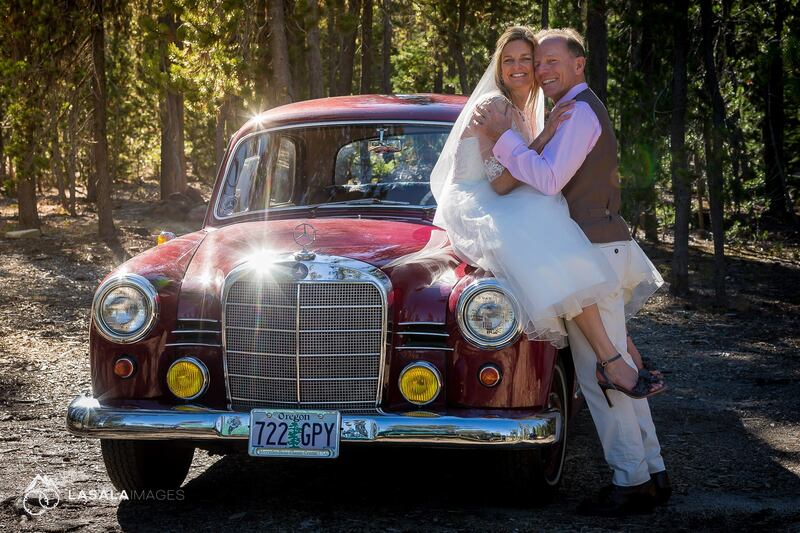 Now it has taken on a new chapter in my life – the getaway (albeit slow) machine for my wedding! Hope you enjoy the photos. I can jot up a little story if you like, but I think it is somewhat self explanatory. There are more photos but didn't want to burden you with too many. 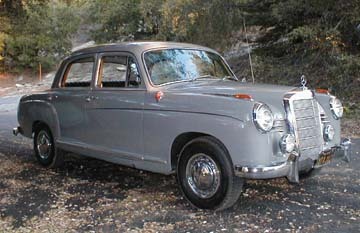 This Ponton sedan sold for $47,000 USD in 2016. I hope you're all doing fine. 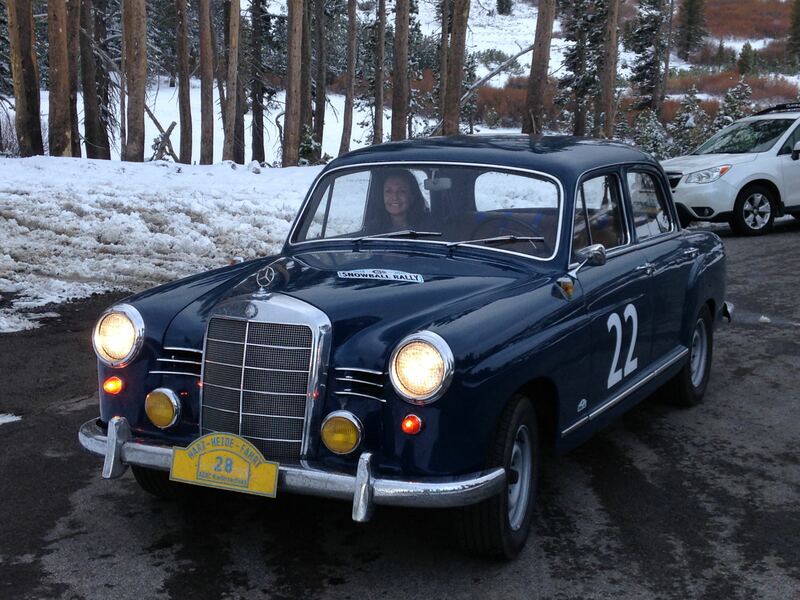 I will share some recent news: I sold my 1961 190b in a private transaction for $47k USD to another collector. 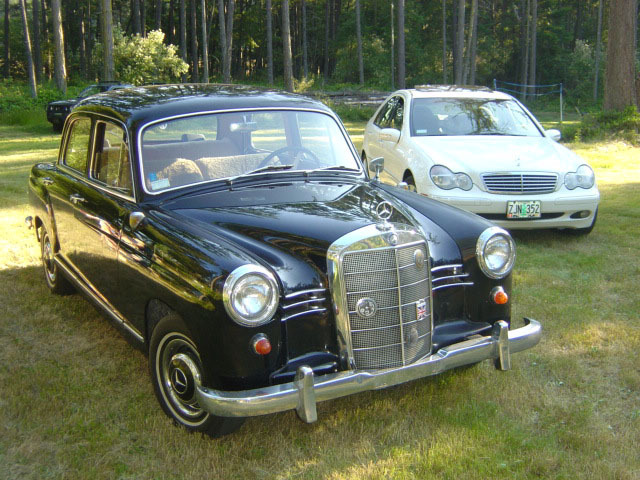 My purpose to share this event is to add incentive to other Ponton owners to value and appreciate their cars. 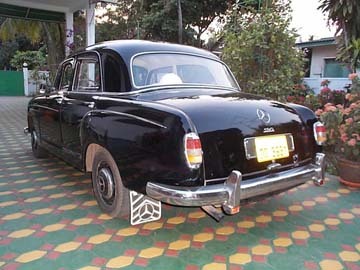 Sometimes it´s sad for me to see the first ones to devaluate our Ponton cars are the owners. That's what I feel, I may be wrong. 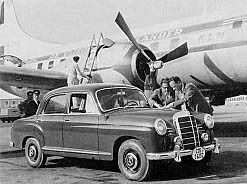 In any case, I think that a private deal for this amount for a 190b is good news for all taking care of these lovely cars. 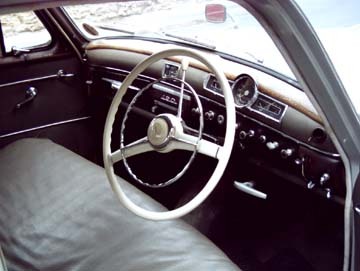 There are 150+ photos with all details about the car included in the zip file. 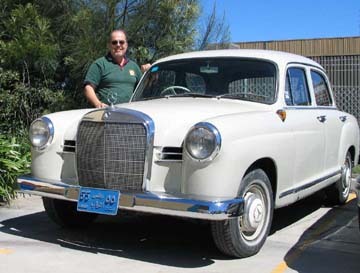 "This Mercedes-Benz was built in Mexico, and now I drive it every single day to work. 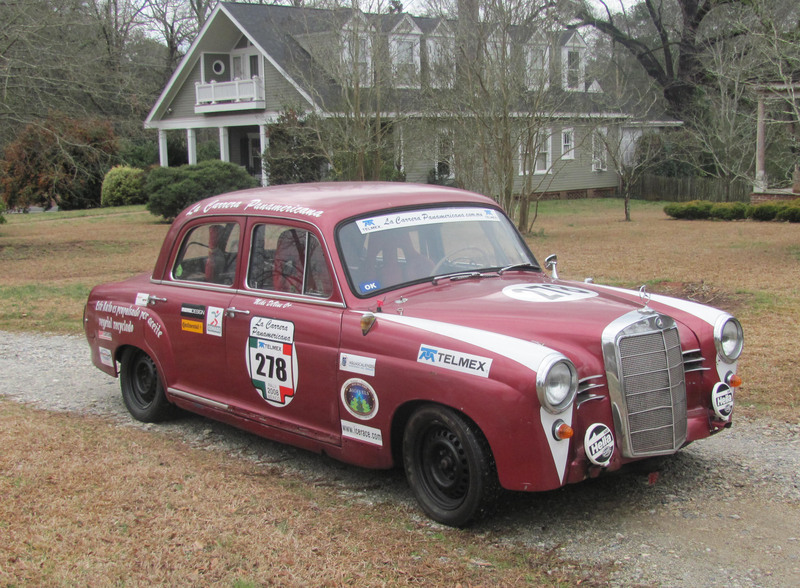 Here is some additional information of my car: Its original owner was an American named Robert Robertson Kearson who owned it from 1961 to 1976. 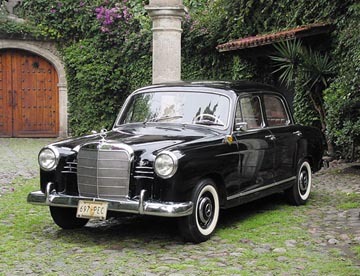 It was bought in Mexico City, but the car "lived" in Cuernavaca (a beautiful city 60 miles away from Mexico City). 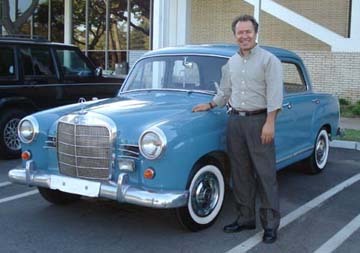 In that year, he sold it to Mrs. Fernandez. She owned it until 1992. 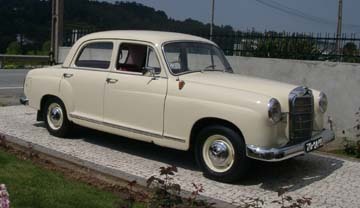 During that time, Mrs. Fernadez' Husband painted it a silver color. 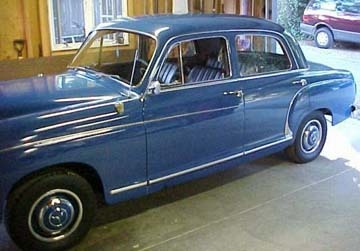 That was the color it had when my grandfather saw it on the road from Mexico City to Cuernavaca. The car was grounded almost 10 years. 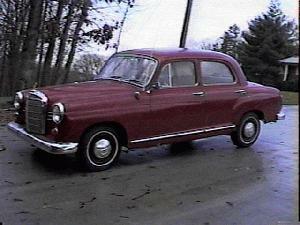 After that, my grandpa bought it, painted it black, tuned it up (almost like new!) and after that, I bought it. 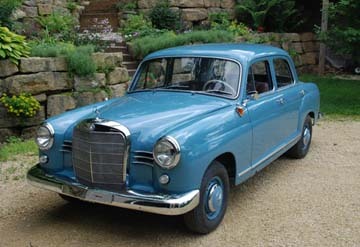 Before I got this car, I thought that every Mercedes-Benz in Mexico was imported. Now I know that they were established here since 1959 or so. 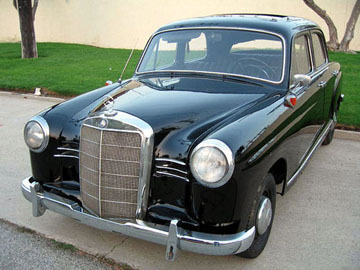 The mass production of Mercedes-Benz in Mexico really began with the 220b Fintail model. Well, that's the story of my car." 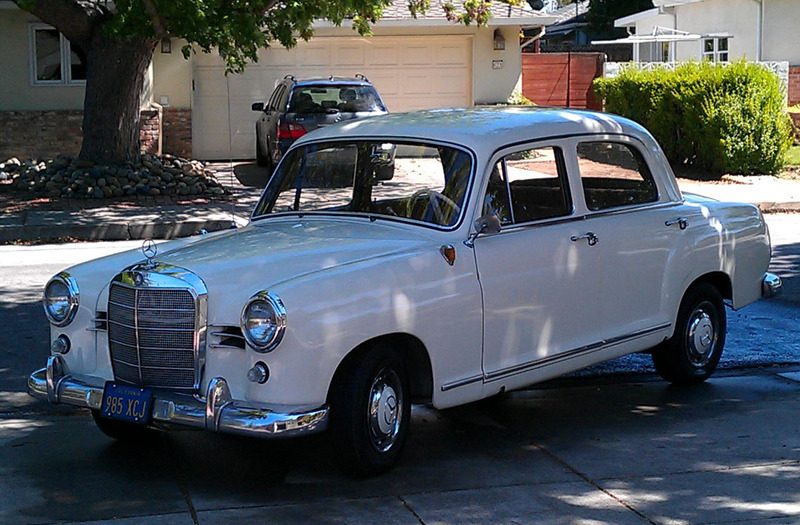 This is the 1961 Mercedes-Benz Type 190b Ponton sedan that I bought three months ago. I am restoring it myself. 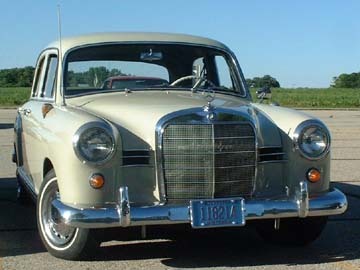 I bought my 1961 190Db in Wisconsin in May of 2002 and I am the fourth owner. 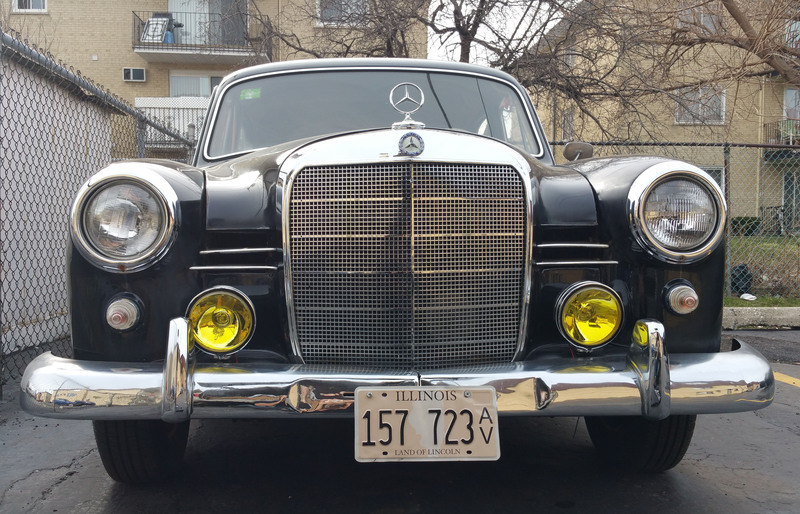 The car has spent all its life in southern Wisconsin and northern Illinois. So it is pretty rusty below and has some holes in the body. Otherwise, it is in really good shape. Last winter I stripped and sanded it down and refilled the holes. Then I had it painted the original color. I also fixed up many little things that were not working due to age. 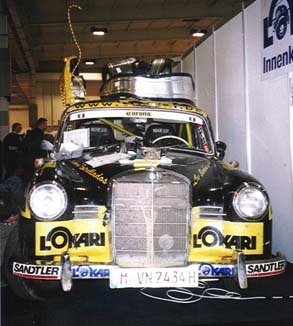 The great thing about the car is that it is all there and it all works, even the window washer! 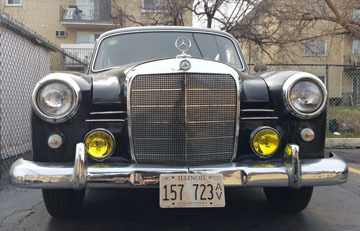 I have a lot of fun driving it around in good weather. It is stored in winters. I don't even try starting it in Wisconsin winters! The car does burn oil at a high rate. 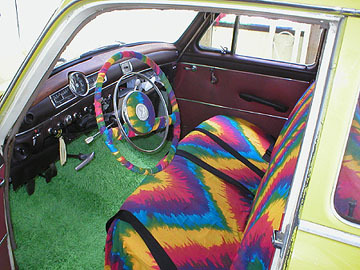 But it gets about 40-45 mpg! So I don't mind too much. I replaced the valve seals, but this did not help any. I had a leak down test done and one of the cylinders is near the low limit. So I am guessing it is the rings. That project will have to wait. 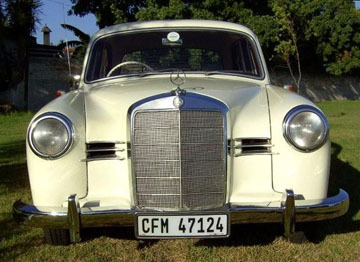 You can see the optional bumper guards which were listed separately in the original bill of sale. The serial number of this car puts it in the last several thousand of this model. It is one of the very last of a true classic. 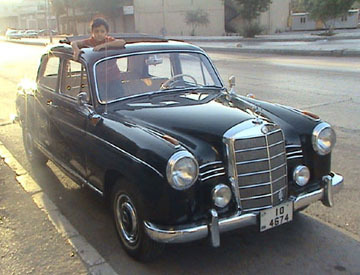 Hello, This is a photo of me driving in a classic car show that took place in Lebanon during the summer of 2004. 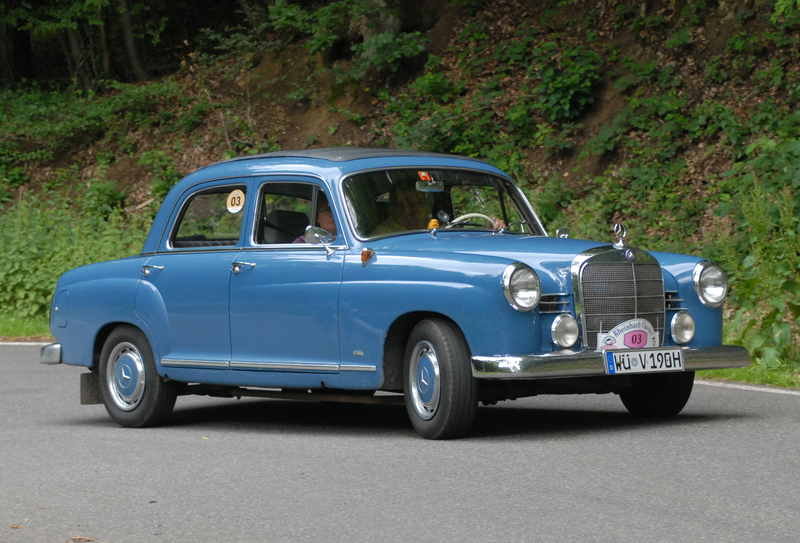 I purchased this 190b from a dealer here in Lebanon who had just imported it from Germany. According to the records, he said it was always owned by the same person since new. 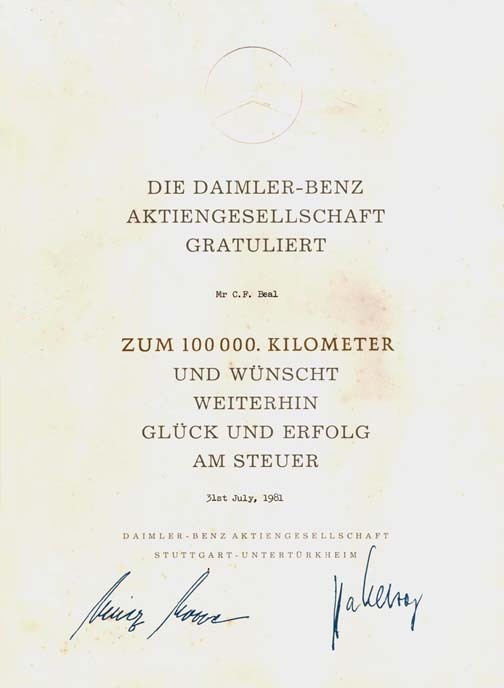 The mileage reading is just over 17,000 km and the state of the car indicates that the mileage reading is true. However, I would like to get to know the owner, as the car dealer said he lost the papers containing the owner's name, and find out if the reading is indeed true, and why all these years the car was unused. The car was in excellent condition and I did very little restoration to it. 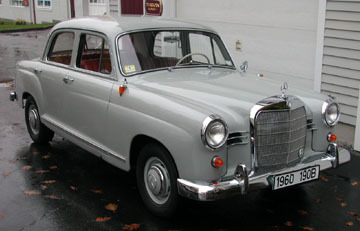 I also own another 1962 180c Ponton sedan and a 1961 190SL roadster. 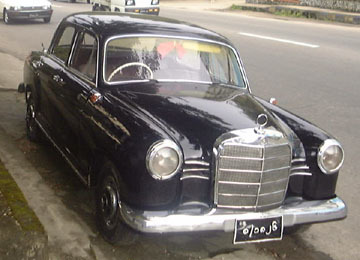 My name is Htay Aung Moe, and I own a 1972 Mercedes-Benz Type W108 280S sedan. I visit the mbzponton web page regularly, and like it very much. My location is Yangon (formerly Rangoon), Myanmar (formerly Burma). I am sending you two photos of my friend's 1960 Mercedes-Benz Type 190b Ponton sedan. My friend, the owner of this Ponton, is Ko Htut. 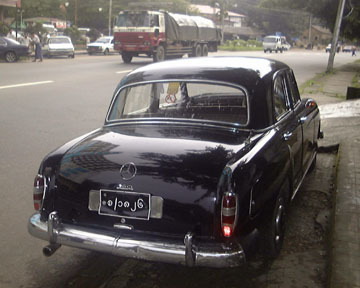 Myanmar had many Pontons until 1986 when the government suddenly announced the cancellation of early registration number (old) vehicles. As a consequence, many classic vehicles, including Pontons, were taken to the crusher. This was very short sighted. Now, only a few Pontons (Types 180/190/220S) can be seen in Yangon. 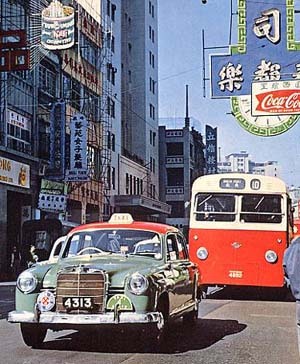 But almost all of them changed their engines to a Japanese diesel. 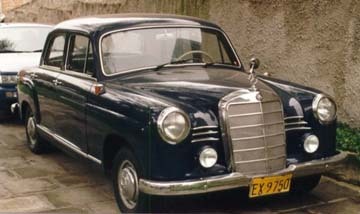 Ko Htut's 1961 Type 190 still has the original engine. 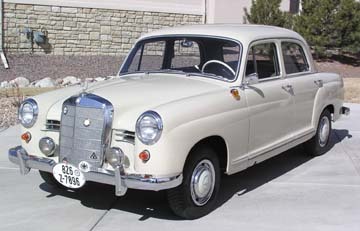 My 1962 Mercedes-Benz model 190b Ponton sedan is located in Green Valley, Arizona. 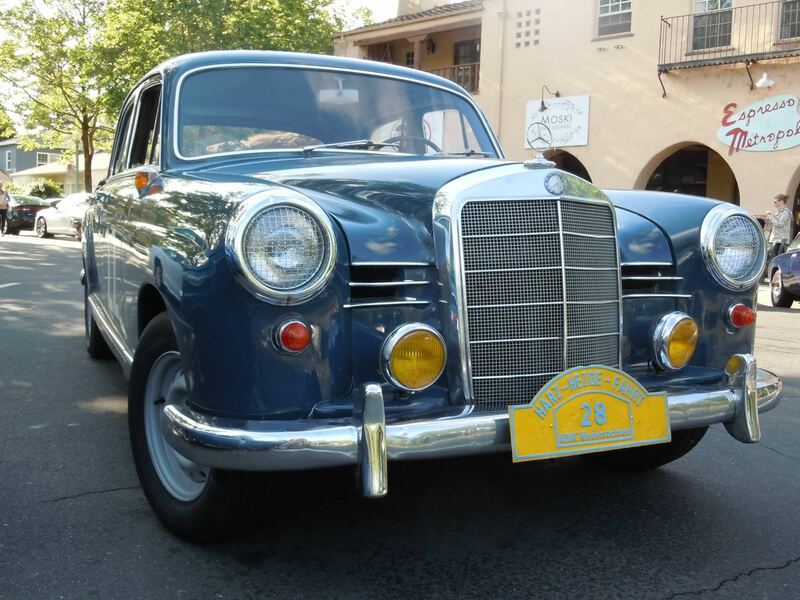 I purchased it in 1985 from its second owner in Jackson, California. 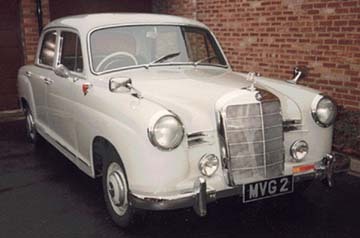 The first owner bought it in 1961 at Coventry Motors in Hollywood. I have all the original books and service records. I believe it has 104,000 miles, and it is in running condition. 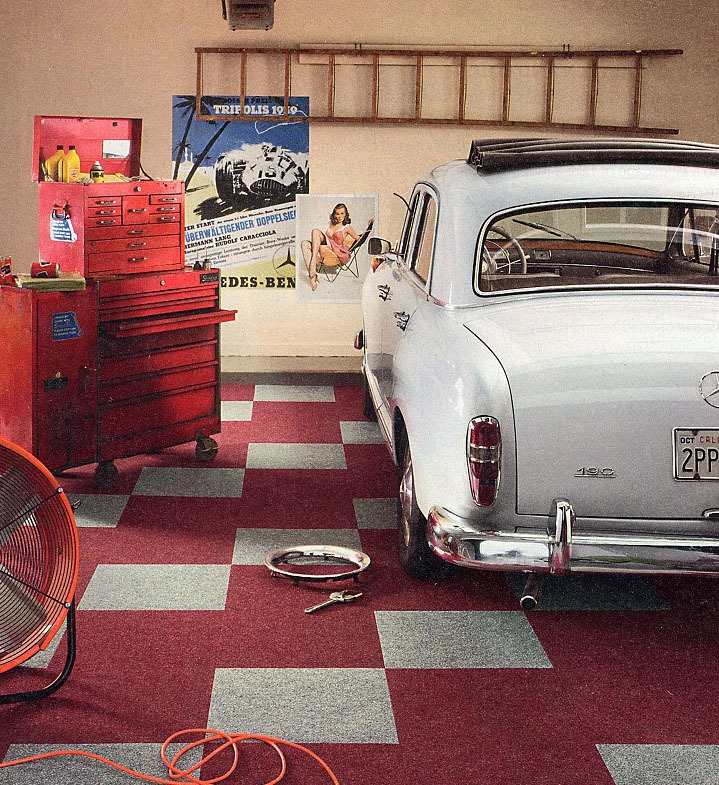 No rust, never driven on salty roads — everything but the seat covers and head liner is original. 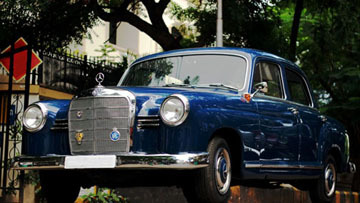 What a car!! !